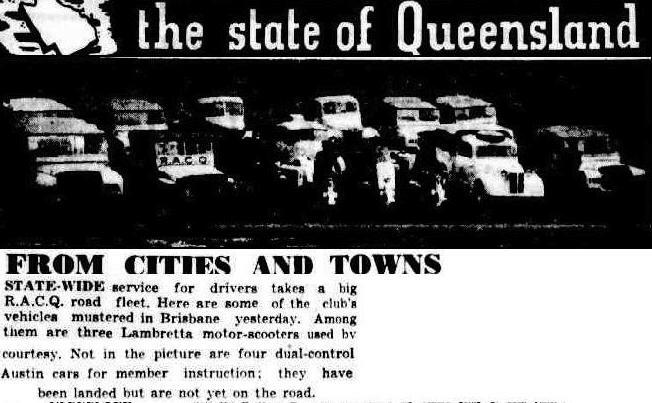 Seems as if the RACQ used Lambrettas in 1950. 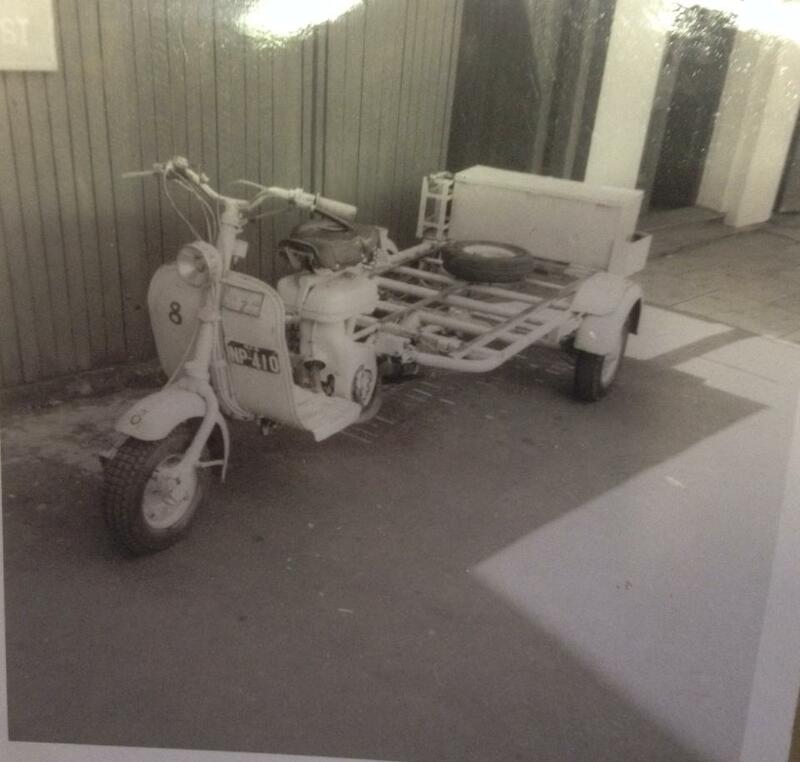 For the past six weeks Main Beach Agent, Eric Dolby has been riding round Southport and Surfers Paradise on his Lambretta motor bike and so far he has only put four gallons of petrol into it. is about a farthing a mile—or less. 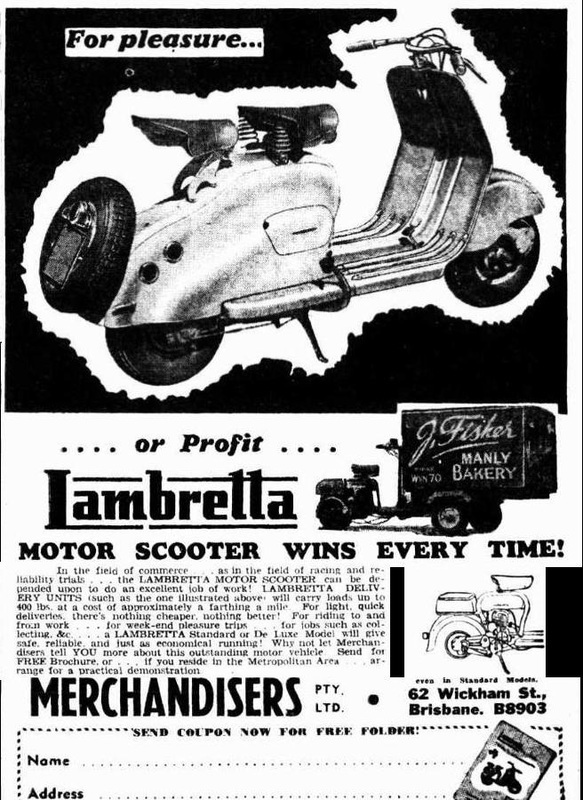 The Lambretta, which is really a motor scooter was designed by aircraft engineers and introduced to the Continent a few years ago. It has only recently reached Australia but is rapidly becoming well known here. 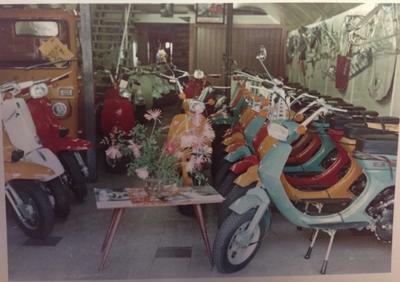 Eric, who has become a Lambretta enthusiast after buying one several weeks ago, is often pulled up in the street by people who are anxious to know (what the) sensational motor (scooter) can do. "I pick up my two children from school and take them home on it, one riding in front one behind. 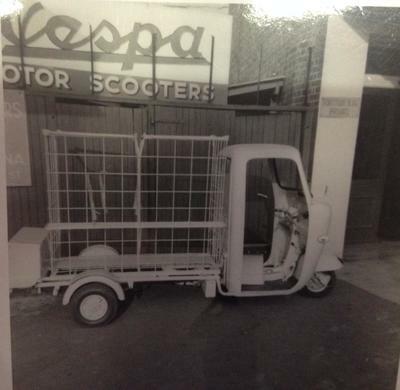 "The scooter carries parcels and its light as a feather to ride." 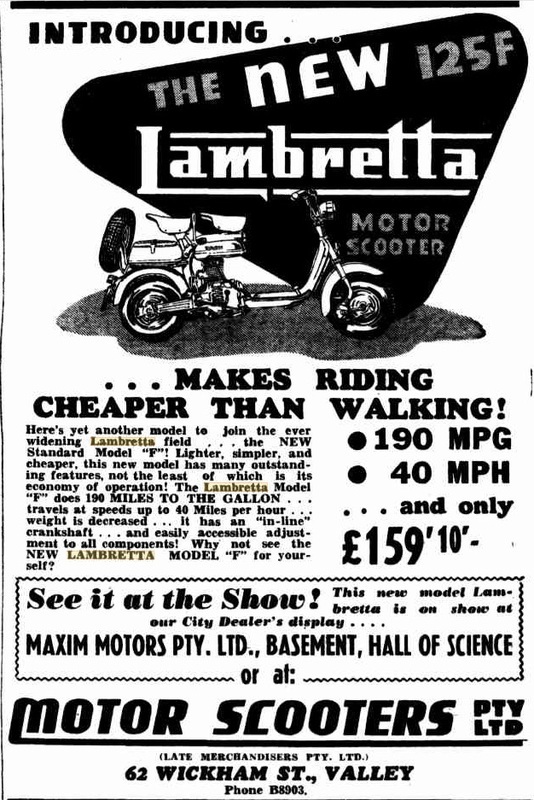 The Lambretta has a 125 cc two-stroke engine. It also has unusually good springing-- hydraulic on the rear wheels-- which makes for smooth riding. Paradise and asked to show it off. I saw the arrival yesterday afternoon of a trio of travellers who had made the journey from Bristane on scooters. Mr. and Mrs. W. Robinson rode a two seater, and sister C. A. Webster rode solo. They were very sensibly clad in warm slacks, long travelling coats, gloves, and mufflers, and had found the journey very cold, but mostly enjoyable. It was their first time over the road and considered the road good, although as they said, a scooter only needs a good track. 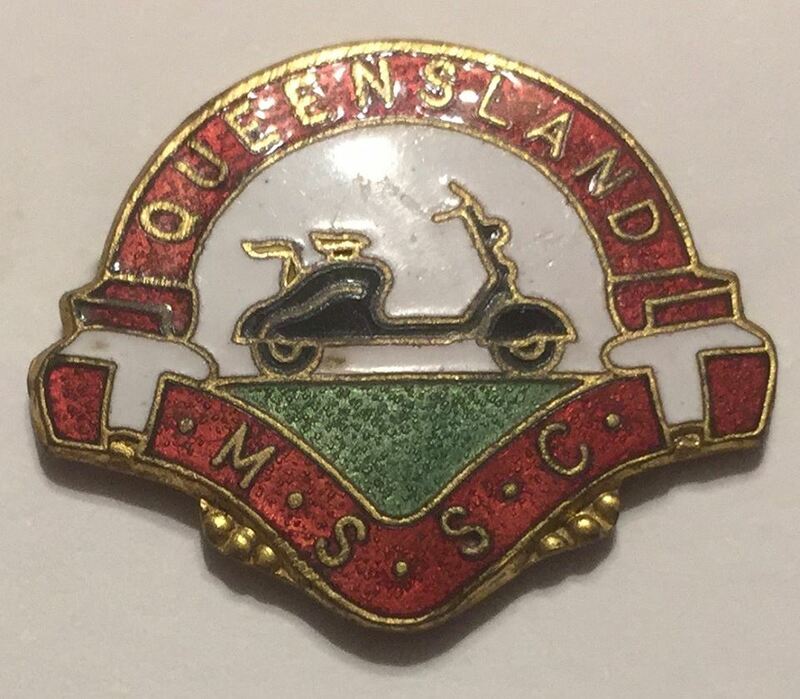 Mr. Robinson is president of the Scooter Club in Brisbane, and the trip up took about six hours. 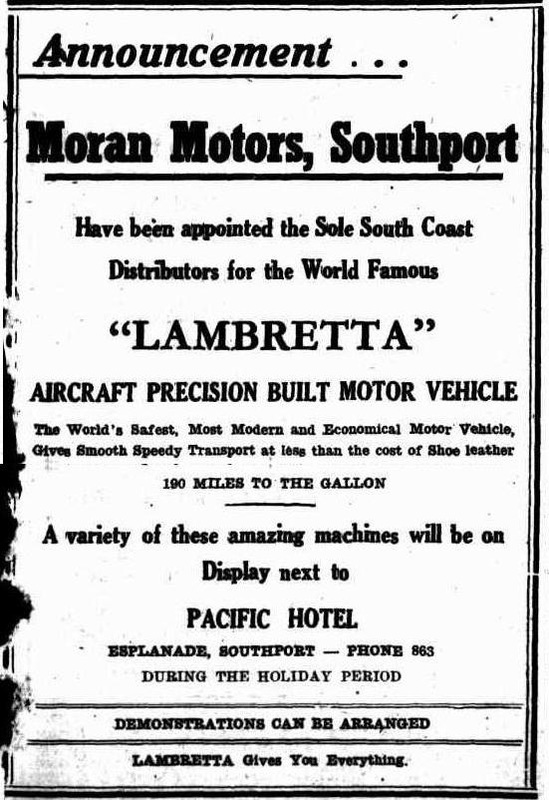 They planned to stay at an hotel overnight and to visit Pialba today, before taking off for Bundaberg where Mr. and Mrs. Robinson will spend a fortnight's holiday. Sister Webster intends to scoot from Bundaberg to Springsure; she is on leave from the Marooma Private Hospital, Brisbane. 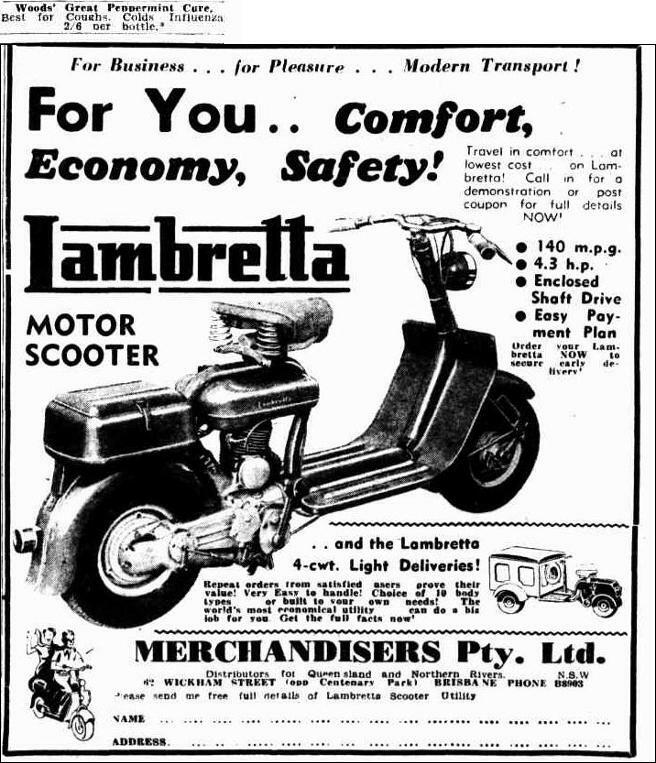 The Lambretta's they were riding, seemed very comfortable, and they certainly are economical, for on inquiring, I learned that the two-seater had carried the two passengers from Brisbane on a gallon and a half of' petrol. 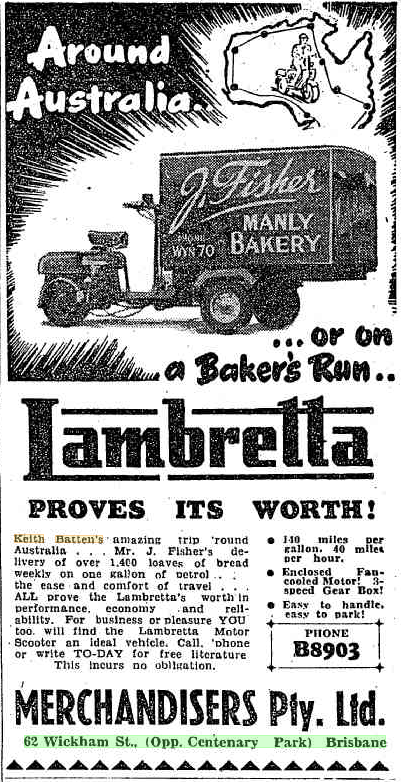 ​Around Australia...or on a Baker's Run..
the ease and comfort of travel . 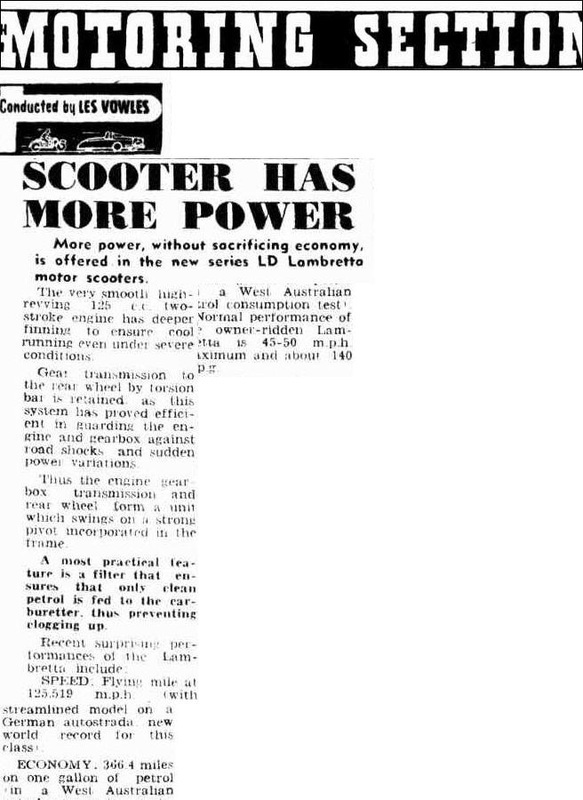 . .
More power, without sacrificing economy, is offered, in the new series LD Lambretta motor scooters. The very smooth, high- .revving 125 c.c. two-stroke engine has deeper finning to ensure cool running even under severe conditions. Gear transmission to the rear wheel by torsion bar is retained, as this system has proved efficient in guarding the engine and gearbox against road shocks and sudden power variations. Thus the engine, gearbox. transmission and rear wheel form a unit which swings on a strong pivot incorporated in the frame. 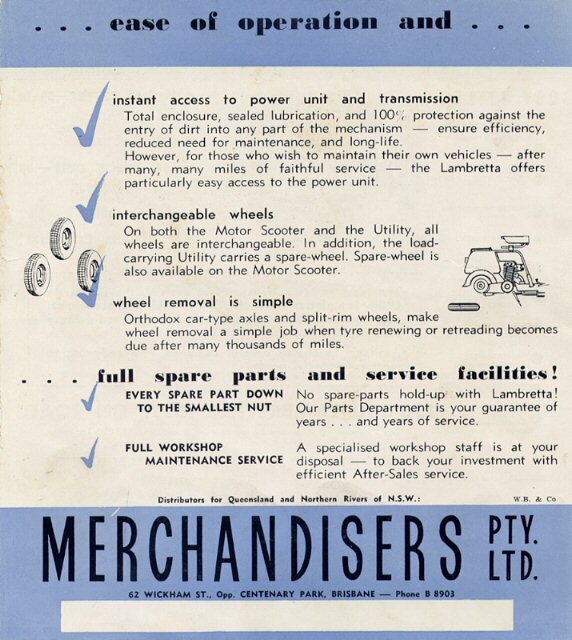 petrol is fed to the carburetter, thus preventing clogging up. SPEED: Flying mile at 125.519 m.p.h. (with streamlined model on a German autostrada; new world record for this class). ECONOMY: 366.4 miles on one gallon of petrol (in a West Australian petrol consumption test). Normal performance of the owner-ridden Lam bretta is 45-50 m.p.h. maximum and about 140 m.p.g. 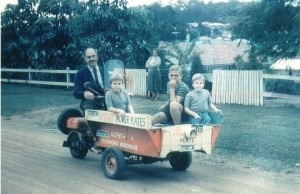 Queensland and the Cairns Motor Cycle Club during Easter. and the crowd was well controlled. In the sidecar championship. Dave Robson, of Cairns, with Nick Barko as passenger, scored a win from R Woodcraft and Jim MacRoth. 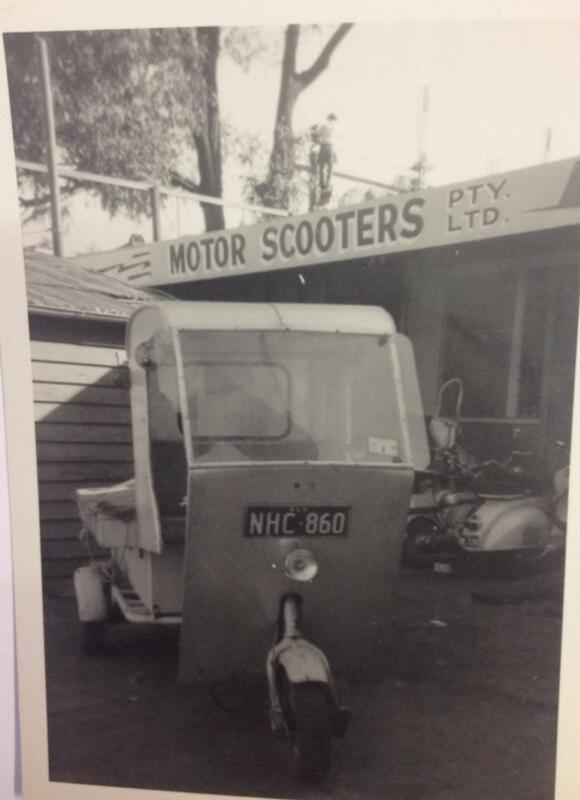 scooter driven by Wavne Robertson. The Ronald's Trophy for visiting drivers was won by K Fry with G. Horwood second and "Snowy" Gasper third. The Junior airstrip championship for motor-cycles was halted when an Auster aircraft landed a passenger on the strip. place with Jim Grey third. Allis* time for the 25 aii'e.« has 24 minutes 26 seconds. Eustace of the R-AAJ*. on an AJS. 500 third. The Watty Bettrklee Trophy for cars resulted: W. Allis ÍXK120 Jaguar-» 1. T. H Bird (T.C. Serlps M.G:» 2. Jim Grey [ fPeiwot) 3. IThe unlimited airstrlo championship for the W. Lons iTronh"
of Cairns, and T*nv Togovl'-h on a Motmuzzi third. TOUT TJe^wi',h second and .Terry içncface third. Th* Moreena ©.A.Tn. Benefited from the meeting. Imagine the thrill of starting a motor, of setting a machine in motion and gliding off as free as the breeze to any place at all. Feel the air brush against your face and see the mile posts fly past. 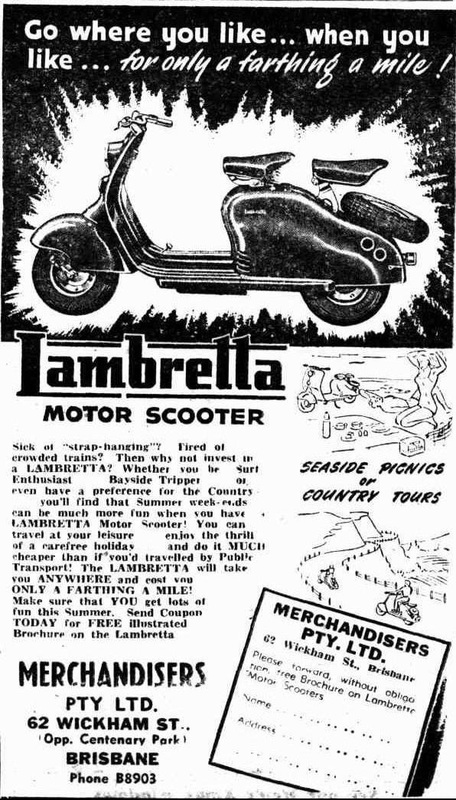 It's great - and YOU can know all these thrills (and many more) when you own a sparkling streamlined Lambretta. 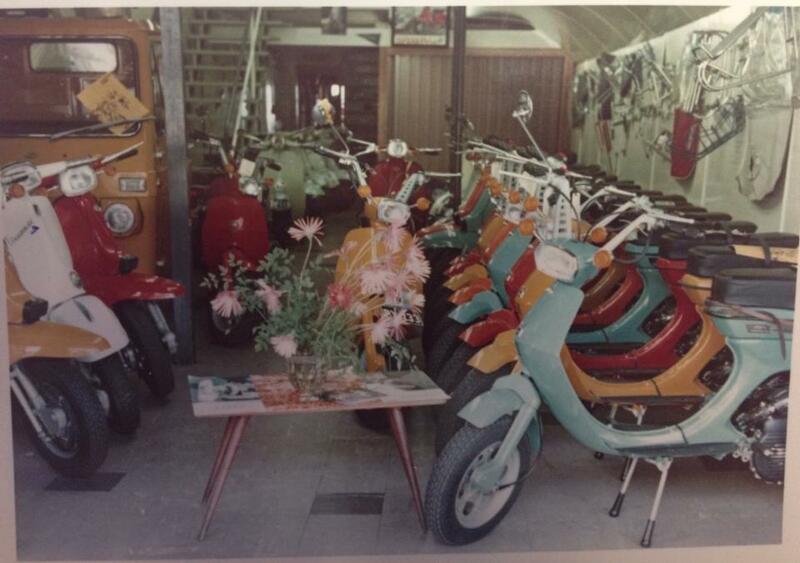 ​Any Lambretta owner will tell you of the sense of freedom, independence, and companionship. 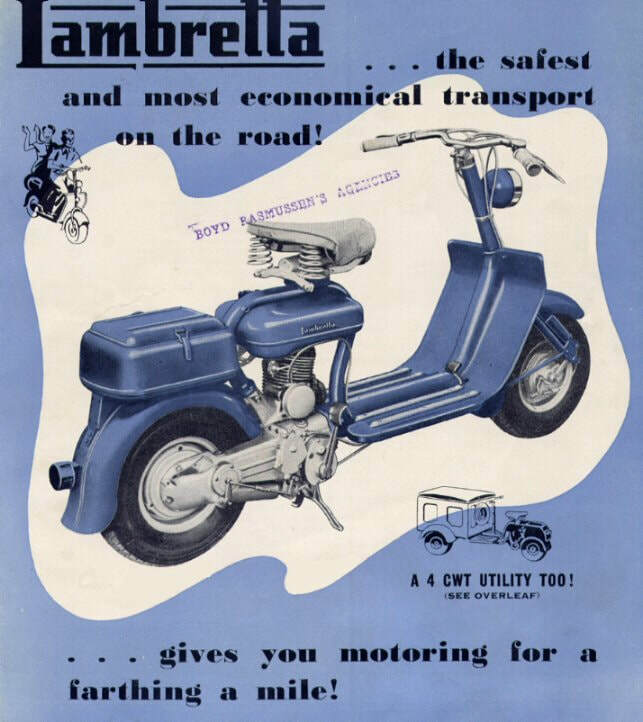 He'll tell you too, of Lambretta's unfailing reliability - its sheer economy (4 miles for 1d) and safety! Call in for a free demonstration ride on the new 1954 models Tomorrow Morning! 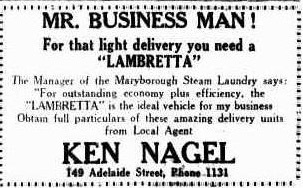 Trial earned Keith Batten of Sydney, riding a Lambretta 3rd. place in a World Wide Reliability Contest. Pulling over 100 lbs. in extra gear and equipment he averaged 100 m.p.g. 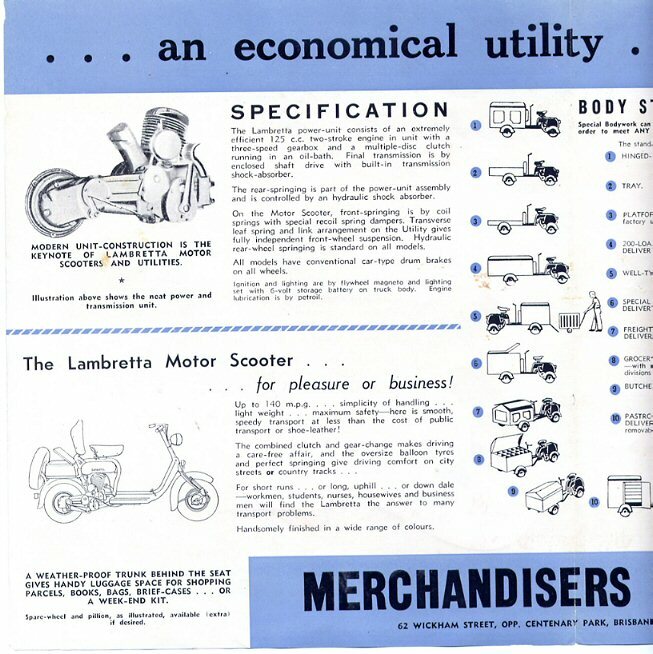 You, too, can experience the same reliability, economy and safety when you own a sparkling, streamlined LAMBRETTA. . Call in for a free demonstration ride on the latest model,Tomorrow morning. provides convenient, reliable and economical transport. 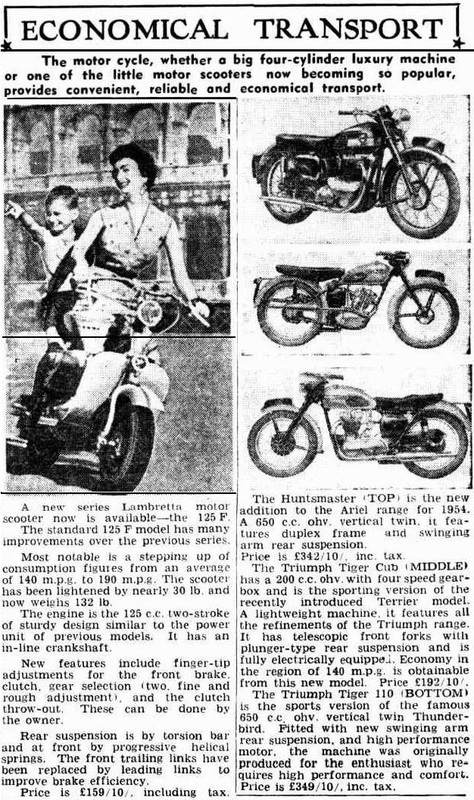 A new series Lambretta motor scooter now is available — the 125 F.
The standard 125 F model has many improvements over the previous series. Most notable is a stepping up of consumption figures from an average of 140 m.p.g. to 190 m.p.g. The scooter has been lightened by nearly 30 lb. and now weighs 132 lb. The engine is the 125 c.c. 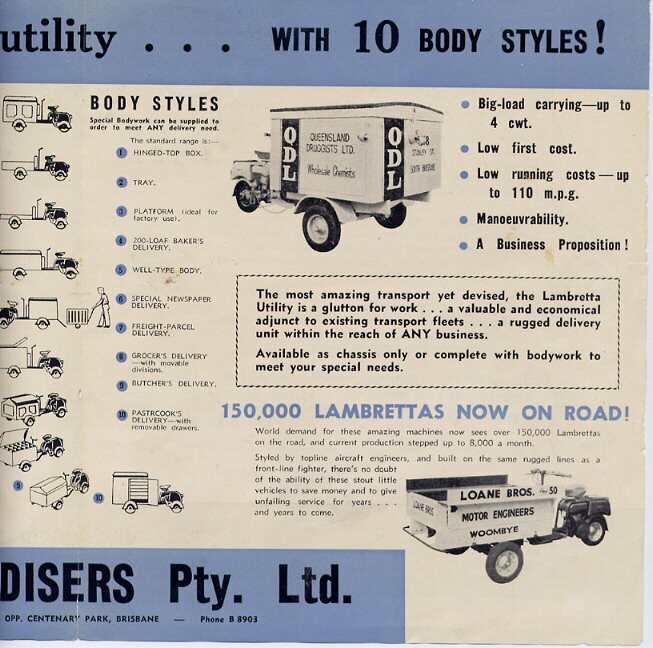 two-stroke of sturdy design similar to the' power unit of previous models. It has an in-line crankshaft. clutch, gear selection (two, fine and rough adjustment), and the clutch throw-out. These can be done by the owner. Rear suspension is by torsion bar and at front by progressive helical springs. The front trailing links have been replaced by leading links to improve brake efficiency. Price is £159/10/, including tax. The Huntsmaster (TOP) is the new addition to the Ariel range for 1954. A 650 c.c. ohv. vertical twin, it features duplex frame and swinging arm rear suspension. Price- is £342/10/, inc. tax. from this new model. Price £192/10/. 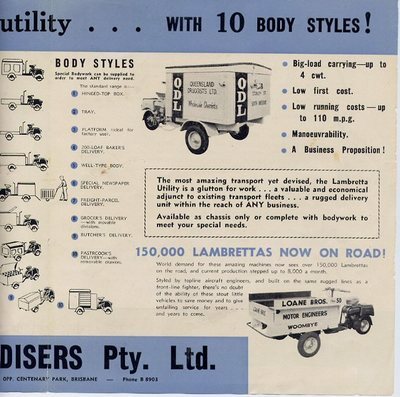 motor, the machine was originally produced for the enthusiast who requires high performance and comfort. Kedron Motor Cycle Club expects a field of 40 to contest a two=day, 270 mile reliability trial next weekend. Riders will leave Centennial Place at 1:30pm Saturday for a 130 mile run with secret controls to Hayden, 30 miles north-west of Toowoomba. 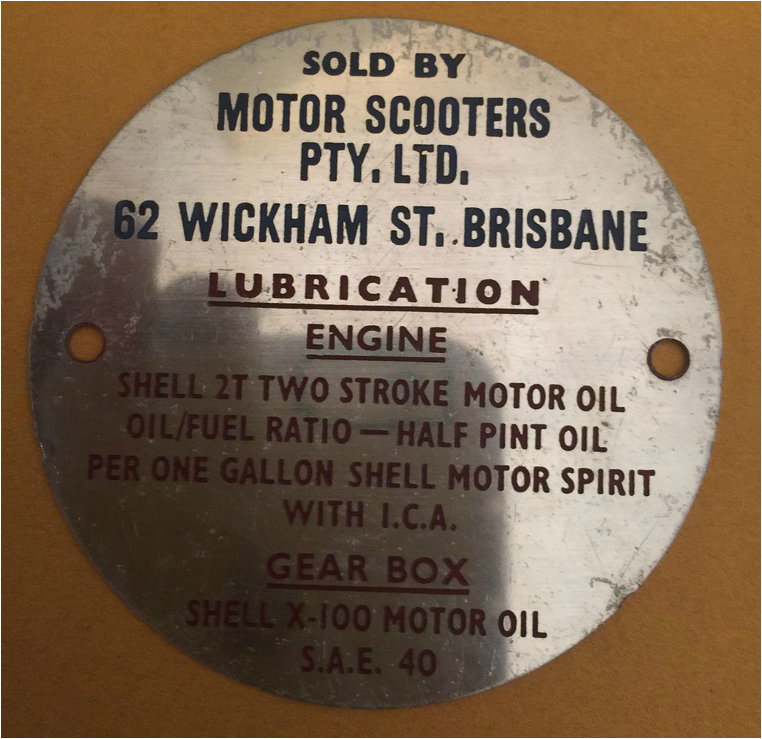 Features of the trial are: No night riding; entry of 12 Lambrettas from Brisbane Motor Scooter Club. 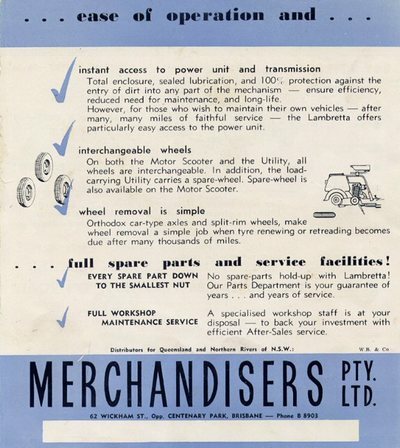 "At first the mowers sat on the floor with little interest to customers. After a period of time and many home demonstrations, they became much sort after. They needed to be ordered and shipped into the store. 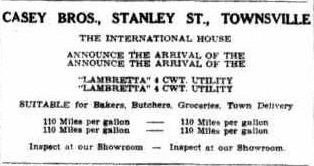 Once a week a ‘truck load’ was delivered to the store to be delivered to customers after the store closed on Saturday at noon. 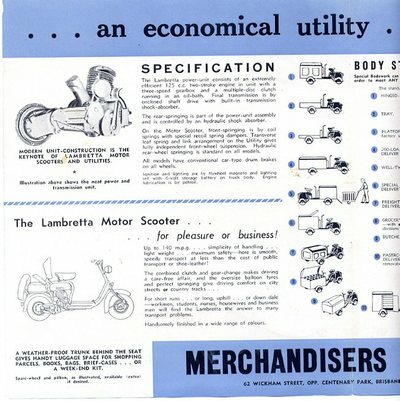 My father purchased a three-wheeled motor scooter, a Lambretta, with a tray on the front to deliver and demonstrate the motor mowers. Business boomed. 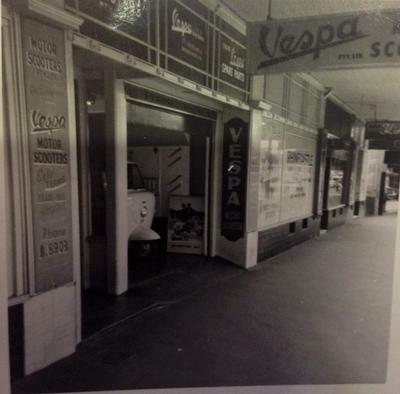 I think Dad was quite a sight as he drove across town and around the area at that time." 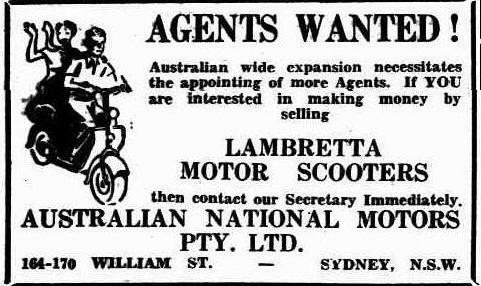 Motor Scooters of Brisbane was a major dealer. Unfortunately we have no dates for the following photographs.